Photos via Club Alfa and Alfa Romeo. 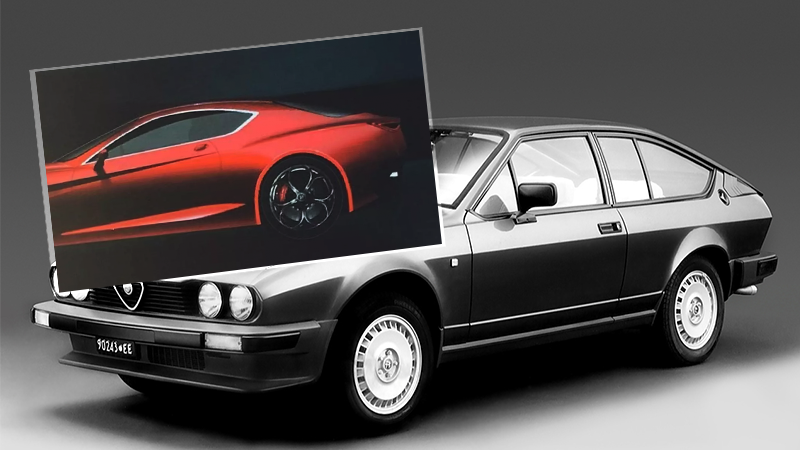 The Alfa Romeo GTV is coming back, and now we may have a leaked look at the roofline of what’s promised to be an all-wheel drive, 600 horsepower coupe which is expected to be a hybrid. This isn’t the first time we’ve seen the car, as the company has already released a tester showing off a glimpse at the front-end treatment of the car. Now we have a profile look at the rear end, and it still looks good. The photo was first posted to the Club Alfa website, which claims the photo, which appears to have been taken during some sort of company presentation, was posted to a “well-known” Facebook group (which is not well-known to me). Sorry folks, we’ve been bamboozled. The GTV moniker is meant to stand for “Gran Turismo Veloce,” which just means a fast grand tourer. The last Alfa to carry the GTV name was a small coupe that went out of production in 2005, which spawned a convertible model called the “Spider” that went out of production in 2006. Before that, the GTV name was slapped on variations of the Alfetta, giving us the famed James Bond GTV6, as well as four-cylinder and V8 versions. The new car seems to be a slight departure from the previous cars that carried the name, though it’s still a two-plus-two coupe just in a much more modern package, seemingly compete with cars like the new BMW 8 Series. As my coworker Tom pointed out, the wheel in the slide image seems a little small for the giant rear overhang, but I’m going to reserve most of my takes until there’s more pictures or something in the flesh. (Update: remember this isn’t real). The real car is expected to come sometime around or after 2022, and really, who could complain about a new Alfa coupe coming to America?